Panama (Agenzia Fides) - A few days ago, exactly on July 9th, the Director of the Holy See Press Office, Greg Burke, broke the news that "on the occasion of the next World Youth Day (WYD) that will be held in Panama City, and welcoming the invitation of the Panamanian Government and Bishops, His Holiness Pope Francis will travel to Panama from 23 to 27 January 2019". The Vice President of Panama, Isabel de Saint Malo de Alvarado, has already held a meeting in the Vatican with the Secretary of State, Cardinal Pietro Parolin, to discuss the details of the organization of WYD 2019 and the visit of the Holy Father. During this meeting it was recalled, according to what Fides learned, that Panama belongs to the Central American Integration System, whose goal is to establish a collaboration on the theme of migration. The Vice-President and Cardinal Parolin agreed on the importance of the region's challenges to democracy and human rights issues, in the context of the political and social crises that Nicaragua and Venezuela in particular are experiencing, and have agreed to work together to support the framework of diplomacy and international law. In Panama, the Archbishop of Panama, Mgr. José Domingo Ulloa Mendieta, OSA, expressed his joy for the official confirmation of the Pope's presence, but at the same time wanted to express his solidarity with the Church of Nicaragua, also in the name of the youth of Panama. Mgr. Ulloa used harsh words to describe this reality, which he knows closely: "The government of Nicaragua goes beyond the limit of the inhuman and immorality. The criminal repression against civilians, mostly young students, is condemned at all levels: the international community cannot be indifferent!". "From this pilgrim Church in Panama, we want to unite ourselves to the condemnation, to the repudiation of acts of aggression against the Nicaraguan people, particularly to all the members of the Nicaraguan clergy", said the Archbishop. "This is nothing but the fruit of the lack of listening to the cry of the people". 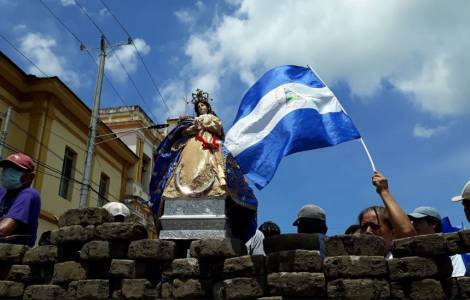 On Wednesday 25 July, there will be a special prayer for Nicaragua at 5 pm in the Basilica of Don Bosco, "so that the Lord may grant the necessary light and, through dialogue, the people of Nicaragua will soon find the peace they desire", said Mgr. Ulloa. "With our prayer and solidarity with the Nicaraguan people and the pilgrim Church in Nicaragua, may the Lord bless you in these difficult times", he concluded. At a diplomatic level, on Thursday, July 19, Panama, through Foreign Minister Luis Miguel Hincapie, expressed his readiness to participate in any dialogue process that could solve the serious crisis in Nicaragua.